Shipping calculations are for the USA only! We'd love your international order. Please contact us directly for shipping costs outside the USA. Squeeze until cleaner fills to second line. Pour into washer and fill to dotted line with purified or distilled water. Shake vigorously for 10-15 seconds. Remove and wipe dry with microfiber cloth. Specially formulated solution, including glycol ether, will leave your glasses cleaner then they have ever been before. When used with our 2020 EURO LENS BATH Cleaning System or 2 OZ To-Go Spray it will remove all dust, grime, sun blocks, body oils, make-up and hair or beauty products, without damaging any coatings or tints. 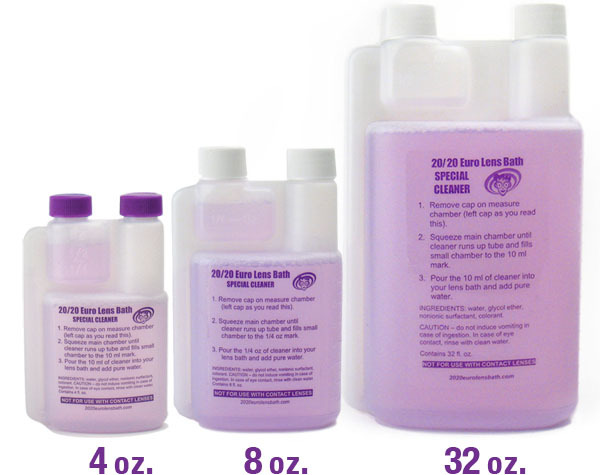 Use the 4oz, 8oz or 32oz solution in its convenient self measuring bottle to refill your 2020 EURO LENS BATH Cleaning System or 2 OZ To-Go Spray. The 4oz, 8oz or 32oz bottle is perfect or families or multiple person use and should last almost 1 full year, getting 30- 80 washes out of each batch of cleaning solution.